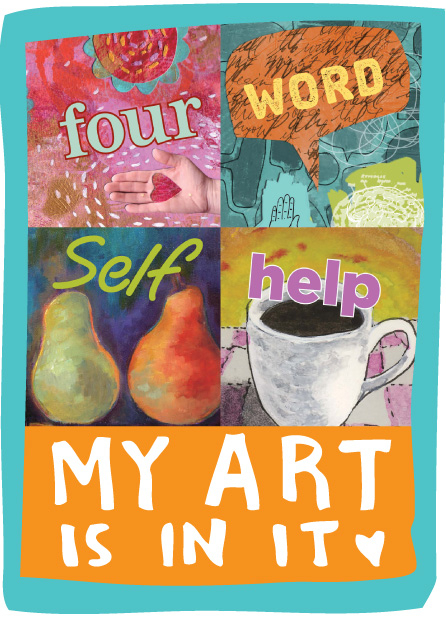 I am honored to announce that one of my mixed media pieces was chosen for inclusion in Patti Digh’s newest book Creative is a Verb: If You’re Alive, You’re Creative. In this book, Patti “leads you by both heart and head to acknowledge, reinforce, and use your own creative spirit by teaching six creative commitments.” Creative is a Verb is the follow-up to Patti’s successful 2008 book Life is a Verb: 37 Days to Wake Up, Be Mindful, and Live Intentionally. Way back in January I received a request to submit two pieces of artwork for Creative is a Verb. Each participating artist was sent one, two, or three essays that would become chapters in the book. We were asked to read our assigned essays and create artwork inspired by the essay. As with previous art submission requests, we had about two weeks to create artwork inspired by the essay. I received two essays. One was titled “Leave Your Base Camp” the other was “Blow Bubbles Everyday.” My submission for “Blow Bubbles Everyday” was chosen and is featured in Chapter 6: Get Present: Show Up Like Magic. The substrate for this piece is a painted and textured magazine page. The horns were inspired by the bubble wands we used as kids (and might still play with as adults…though I’m not saying which adult, ahem.) 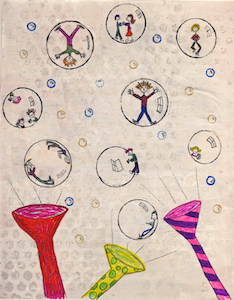 The little characters inside the bubbles are smiling, dancing, reading, hanging out, hanging on, and waving. I think I channeled a bit of Tim Burton for this piece. 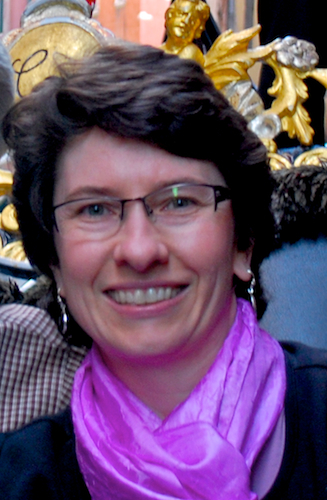 Thanks again to Patti Digh for this wonderful opportunity. 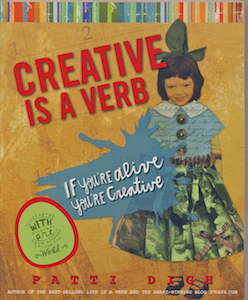 You can purchase a signed copy of Creative is a Verb on Patti’s website or on Amazon (unsigned copies). 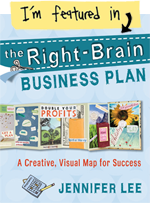 Categories: Amy's Art, art, Artists, Creativity, Humor, Inspiration, Mixed Media, Opportunity | Tags: art, book art, Books, bubbles, Creativity, gratitude, Humor, Inspiration, Mixed Media, opportunity, Patti Digh, success, Tim Burton | Permalink. And the Way goes nowhere. Don’t look for anything but this. Categories: Favorite stuff, Inspiration, Philosophy, Quotable Monday, Quotes, Spirituality | Tags: Clarity, direction, Inspiration, life, mind, philosophy, Quotable Monday, Quotes, Spirituality, Zen, Zen Master Ryokan | Permalink. Have you ever had one of those weeks? One where you feel like your ‘get up and go’ has gotten up and left the building? That is definitely how I’m feeling right now. I’ve had so many ideas and inspiration the past couple of weeks, starting with the trip we took to Italy last month. After returning I focused on preparing to teach my class at Ink About It. Once that was done, there was an art guild demo at the library, preparing for my first series of classes in my studio, a birthday celebration, trying to edit over 300 pictures taken in Italy, and working on a wholesale order. I put myself on a more structured schedule by blocking out designated time on my calendar to work on all these tasks. I was motivated. I was focused. I was making forward progress. And then there was the vet appointment. Woody is our eldest cat. He is 11 years old. Because he is considered a ‘senior cat,’ I weigh him once a month. Because cats are good at hiding pain and illness and we usually don’t see it until they show obvious weight loss, this monthly weigh-in is part of his care program. When I weighed him at the beginning of September he was 11.8lbs. At the beginning of October he weighed 10.6lbs. My heart sank. I knew he felt lighter when I picked him up when we came home after vacation. But a whole pound? Not convinced this weight was legit, I kept weighing him at different times and different days and on different scales. Nope. It was true. He had lost weight. I called the vet and made an appointment. His annual physical would be in November anyways, so pushing it up a month was okay. The morning of Woody’s vet appointment he was curled up on the ottoman in our living room. I talked with him and went upstairs. Later I heard a thud. And then I saw Woody walking down the hallway toward our bedroom. He wasn’t walking right. He was limping, favoring his right side, and his gait was off. What the heck happened? Did he have a stroke? Did he fall off the ottoman? Did he roll off the ottoman? I felt a bit of panic set in. This was a definite change in status. At breakfast he was fine. Now this. 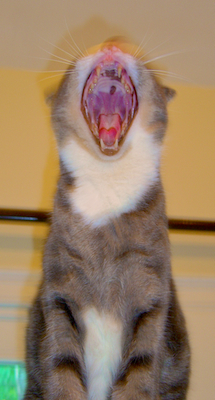 I called the vet but couldn’t bring him in any earlier because Dr. B’s schedule was full. I carried Woody down to the main floor. He went down and up the basement stairs on his own, hopped into the dining room chair, and later into his favorite chair in the living room. But any time he walked, he looked pretty bad and in pain. I decided to work in the dining room so I could keep an eye on him for the morning. He curled up and slept. I worked with one eye on him. At lunch time he hopped off his chair. His gait was 95% better. He wanted to eat. I was so relieved. After examining Mr. Woody, Dr. B told me that Woody may have early arthritis. Woody denied this as he skillfully jumped off the examining table to the floor without any difficulty. It is probable that Woody jumped or fell or rolled off the ottoman, landed hard, and that resulted in the limpy-gimpy walk. A couple hours rest resolved it. His weight loss wasn’t as bad as our scale revealed. During a May vet visit, Woody weighed 11.14lbs. On this visit he weighed 11.07lbs. A seven ounce loss was a bit better than a full pound drop. We’ve also been monitoring Woody’s kidney values since January. So a blood test was ordered. A day later we learned that his kidney values have risen indicating early kidney disease. His potassium is low (which might explain the weight loss and muscle weakness) but other values (thyroid, liver, phosphorus are all good.) However, Dr. B also suspected that Woody might have a kidney infection. 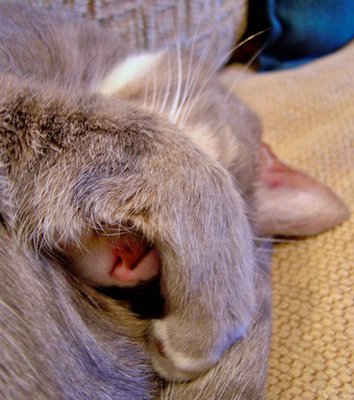 Have you ever had to get a urine sample from a cat? Suffice to say we got the sample and it confirmed a kidney infection. Now we’re giving Woody a 14 day course of antibiotics and a potassium supplement. He also has a prescription for Benazepril (an anti-hypertensive) that we’ll start after the antibiotics. When all this happened with Woody, my focus on work drifted away. I had set an intention to create a small sculpt study on a daily basis. I got three pieces done. I had started editing our pictures from Italy. I only got through a few favorites from our time in Rome. I muddled through a wholesale order. A friend and mentor told me to take a step back. To give myself some time and set a date in November to start work on these nuggets of inspiration after my classes and holiday show are done. A great idea, though sometimes easier said than done. Another person mentioned that in the fall, they are filled with a mix of go-go-go and a desire to simply sit, to contemplate the year, and to draw inward. I can relate to that too. I have a list of things I want to do, things I have to do, that I’ve let slip. The motivation isn’t here at the moment. It doesn’t feel like overwhelm and hitting the wall (which I wrote about here.) It just feels like my get up and go, got up and went. I’m sure the events of the last few days with Woody have had some impact. 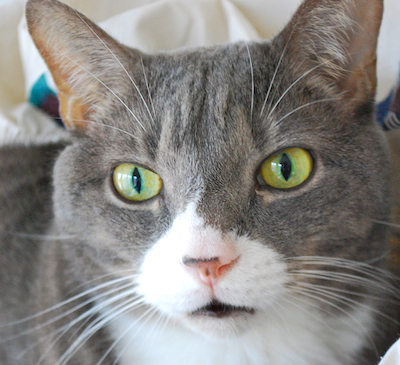 On one hand, a voice tries to tell me “he’s just a cat.” But the louder voice tells me that Woody is my “baby”, my “kid”, my furry, four-legged companion and I am his steward and his caregiver. So far, Woody is tolerating the antibiotics (though administering them is a bit of a challenge at times.) I have to get another urine sample after the meds are finished and make a follow-up appointment with the vet. He is back to his usual routine. I’m sure I’ll be back to mine soon too. Categories: Balance, Favorite stuff, health, Humor, Nature | Tags: cat care, cat health, cat vets, Cats, change, chronic renal failure, emotions, fear, health, Humor, kidney disease, motivation, Nature, philosophy, time | Permalink. Every individual in the world has a unique contribution. Categories: Favorite stuff, Inspiration, Philosophy, Quotable Monday, Quotes, Spirituality | Tags: contribute, individual, Inspiration, Jack Kornfield, life, philosophy, Quotable Monday, Quotes, Spirituality, world | Permalink. Materials: All materials provided by instructor. However, if you have any of the following, please bring them with you: a hand crank pasta machine, pink or flesh tone blush, needle tool or thin knitting needle (1.25mm or 2mm), tiny star cutter (Kemper cutters with plunger). To register for this class, call Ink About It at 978.392.0321 or stop by the store. Categories: Amy's Art, art, Art Date, Creativity, Humor, Inspiration, Opportunity, Sculpture, Teaching | Tags: art, Art class, Business, Creativity, Humor, Ink About It, ornaments, Polymer clay, Santa Claus, Sculpture | Permalink. 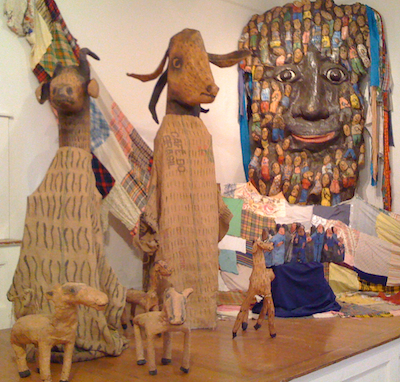 Earlier this year the New Art Center in Newtonville, MA had a wonderful little exhibit: Extraordinary: Puppetry, Storytelling, & Spirit. 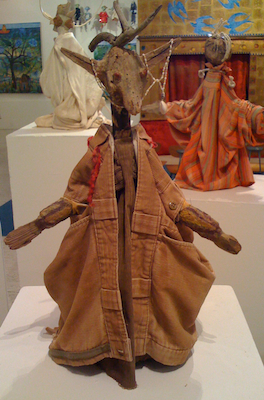 The exhibit featured puppets, marionettes and characters created from a variety of materials. 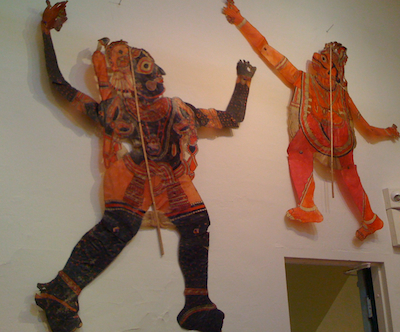 It was an interactive exhibit that allowed visitors to manipulate several of the puppets and invited children (of all ages I assume) to create and play with hand puppets and put on your very own puppet show. Here are some pictures from the exhibit. Next, paper dolls on rods in a slide theatre. These were fun because you could move the dolls and create your own story. 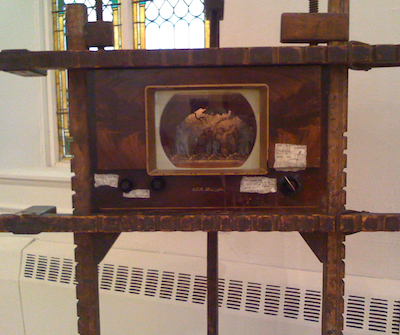 Jeff Sias’s “Victor Contained” is a puppet theatre contained in a vintage RCA television. 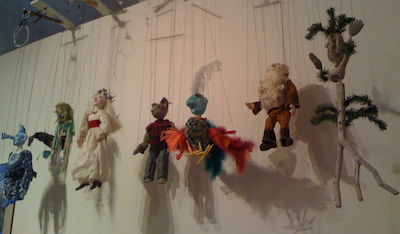 Here are marionettes by Donald Saaf and Julia Zanes. 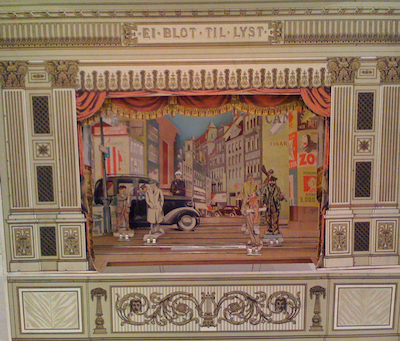 The marionettes are part of the Bluebird Theatre. 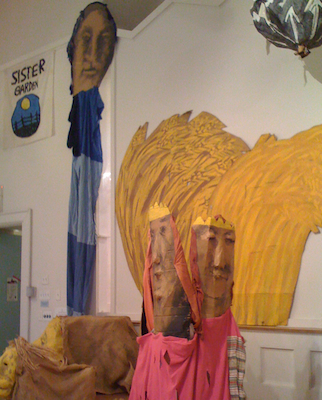 Next are amazing puppets made by Ashley Bryan. 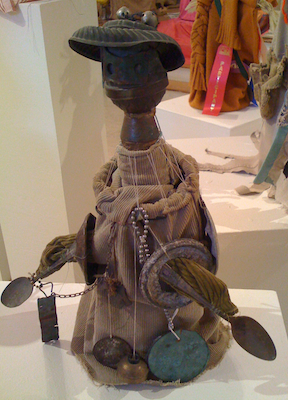 Bryan crafts his puppets from detritus he picks up on walks along the beach. 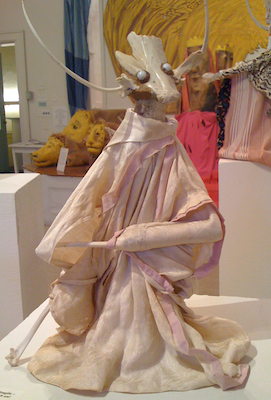 These puppets are homely and magical at the same time. 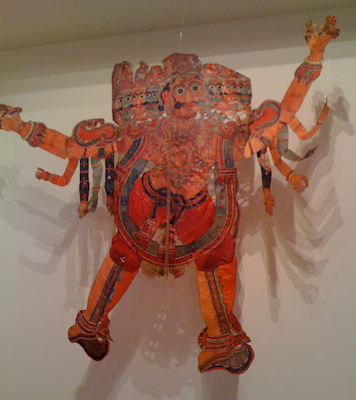 This was a fun exhibit because it brought out the child in everyone. 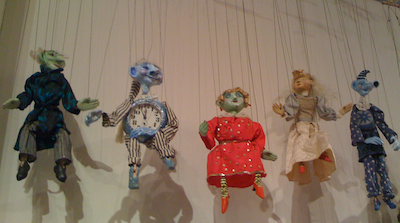 Do you remember the first puppet you ever made? I think mine was either made from a sock or a brown paper bag. What is your favorite shadow puppet to make with your hands? 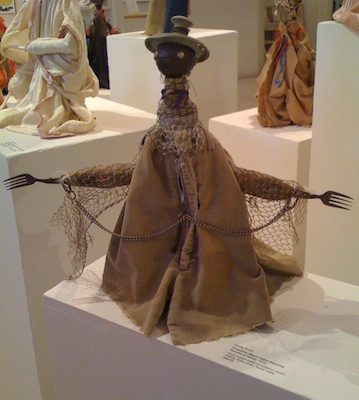 Categories: art, Art Date, Artists, Creativity, Humor, Inspiration, Mixed Media, Sculpture | Tags: art, Art shows, Ashley Bryan, Bluebird Theatre, Bread and Puppet Theatre, Creativity, Exhibits, Humor, Inspiration, marionettes, Mixed Media, New Art Center, puppets, Tolu Bommalata, Vermont | Permalink. Categories: Favorite stuff, Inspiration, Philosophy, Quotable Monday, Quotes, Spirituality | Tags: gratitude, H.H. The Dalai Lama, Inspiration, life, Nature, philosophy, Quotable Monday, Quotes, Spirituality | Permalink.